Published on June 1, 2017 in Construction News, Daily Dirt and National. Closed Tags: asphalt, bridges, construction industry, contractors, economy, Federal Highway Administration (FHWA), Federal Highway Trust Fund, gas tax, Highway Bill, highways, infrastructure, Interstate Highway System, jobs, National Highway Traffic Safety Administration (NHTSA), pavement, roads, safety, the American Association of State Highway and Transportation Officials (AASHTO), The Bureau of Transportation Statistics (BTS), the Texas Transportation Institute (TTI), the U.S. Census Bureau, transportation, TRIP, trucks. Roads and bridges that are deteriorated, congested or lack some desirable safety features cost Mississippi motorists a total of $2.9 billion statewide annually – as much as $2,046 per driver in some urban areas – due to higher vehicle operating costs, traffic crashes and congestion-related delays. Increased investment in transportation improvements at the local and state levels could relieve traffic congestion, improve road, bridge and transit conditions, boost safety, and support long-term economic growth in Mississippi, according to a new report released today by TRIP, a Washington, DC based national transportation organization. The TRIP report, “Mississippi Transportation by the Numbers: Meeting the State’s Need for Safe Smooth and Efficient Mobility,” finds that throughout Mississippi, nearly two-thirds of major locally and state-maintained urban roads are in poor or mediocre condition and 12 percent of Mississippi’s locally and state-maintained bridges are structurally deficient. The state’s major urban roads are becoming increasingly congested, with drivers wasting significant amounts of time and fuel each year. And, more than 3,100 people were killed on the state’s roads from 2011 to 2015. Mississippi had the third highest traffic fatality rate in the nation in 2015. Driving on Jackson area roads costs Mississippi drivers a total of $2.9 billion per year in the form of extra vehicle operating costs (VOC) as a result of driving on roads in need of repair, lost time and fuel due to congestion-related delays, and the costs of traffic crashes in which the lack of adequate roadway safety features likely were a contributing factor. The TRIP report calculates the cost to motorists of insufficient roads in the Gulfport-Biloxi-Pascagoula, Hattiesburg, Jackson and Southaven-DeSoto County urban areas. A breakdown of the costs per motorist in each area along with a statewide total is below. The TRIP report finds that 43 percent of Mississippi’s major locally and state-maintained urban roads and highways have pavements in poor condition and 21 percent are rated in mediocre condition. Twelve percent of major urban roads are in fair condition and the remaining 24 percent are rated in good condition. Driving on deficient roads costs Mississippi motorists an additional $1.4 billion each year in extra vehicle operating costs, including accelerated vehicle depreciation, additional repair costs, and increased fuel consumption and tire wear. Increasing levels of traffic congestion cause significant delays in Mississippi, particularly in its larger urban areas, choking commuting and commerce. Traffic congestion costs Mississippi drivers $530 annually in the form of lost time and wasted fuel. Twelve percent of Mississippi’s bridges are structurally deficient, with significant deterioration to the bridge deck, supports or other major components. Traffic crashes in Mississippi claimed the lives of 3,109 people between 2011 and 2015, an average of 622 fatalities per year. Mississippi’s overall traffic fatality rate of 1.70 fatalities per 100 million vehicle miles of travel is significantly higher than the national average of 1.13 and the third highest rate in the nation. The state’s rural roads have a traffic fatality rate that is more than four times the fatality rate on all other roads in the state. The efficiency and condition of Mississippi’s transportation system, particularly its highways, is critical to the health of the state’s economy. Annually, $277 billion in goods are shipped to and from sites in Mississippi, mostly by truck. Seventy-seven percent of the goods shipped annually to and from sites in Mississippi are carried by trucks and another eight percent are carried by courier services or multiple mode deliveries, which include trucking. 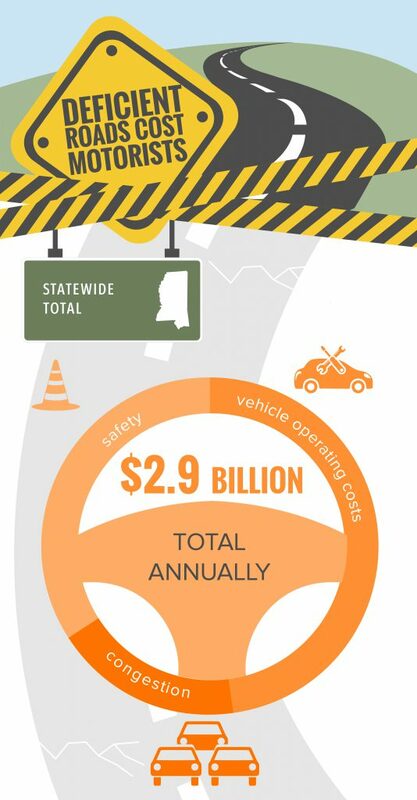 $2.9 billion Driving on deficient roads costs Mississippi motorists a total of $2.9 billion annually in the form of additional vehicle operating costs (VOC), congestion-related delays and traffic crashes. Southaven-DeSoto County- $1,870 TRIP has calculated the cost to the average motorist in the state’s largest urban areas in the form of additional VOC, congestion-related delays and traffic crashes. Drivers in the state’s largest urban areas incur annual costs as a result of driving on deficient roads as follows: Gulfport-Biloxi-Pascagoula – $1,267; Hattiesburg- $1,293; Jackson – $2,046, Southaven-DeSoto County- $1,870. 2 of 3 miles Nearly two of every three miles of Mississippi’s major urban roads are in either poor or mediocre condition, with 43 percent rated in poor condition and 21 percent rated in mediocre condition. Southaven-DeSoto County-44% The share of major urban roads in poor or mediocre condition in the state’s largest urban areas is as follows: Gulfport-Biloxi-Pascagoula, 41 percent; Hattiesburg, 51 percent; Jackson, 63 percent; and Southaven-DeSoto County 44 percent. 4X The fatality rate on Mississippi’s rural roads is more than four times the fatality rate on all other roads in the state (2.93 fatalities per 100 million VMT vs. 0.70). 2,098 bridges Twelve percent of Mississippi’s bridges (2,098 out of 17,068) are structurally deficient, the 12th highest rate in the nation. A bridge is structurally deficient if there is significant deterioration of the bridge deck, supports or other major components. 3rd Mississippi’s traffic fatality rate of 1.70 fatalities per 100 million vehicle miles of travel is the third highest in the nation. Southaven-DeSoto County-43 hours Increasing congestion, particularly in the state’s urban areas, is causing significant delays for residents and businesses. The average Gulfport-Biloxi-Pascagoula driver loses 19 hours annually to congestion, Hattiesburg drivers lose 13 hours each year, Jackson drivers lose 38 hours, and Southaven-DeSoto County drivers lose 43 hours. $1 = $4 to $5 Every $1 of deferred maintenance on roads and bridges has been found to cost an additional $4 to $5 in needed future repairs. $1.00 = $5.20 The Federal Highway Administration estimates that each dollar spent on road, highway and bridge improvements results in an average benefit of $5.20 in the form of reduced vehicle maintenance costs, reduced delays, reduced fuel consumption, improved safety, reduced road and bridge maintenance costs, and reduced emissions as a result of improved traffic flow. Quality of life and economic progress are riding on Mississippi’s transportation system. The rate of economic growth in Mississippi, which is greatly impacted by the reliability and condition of the state’s transportation system, has a significant impact on quality of life in the Magnolia State. An efficient, safe and well-maintained transportation system provides economic and social benefits by affording individuals access to employment, housing, healthcare, education, goods and services, recreation, entertainment, family, and social activities. It also provides businesses access to suppliers, markets and employees, all critical to a business’ level of productivity and ability to expand. Reduced accessibility and mobility – as a result of traffic congestion, a lack of adequate capacity, or deteriorated roads, highways, bridges and transit facilities – diminishes a region’s quality of life by reducing economic productivity and limiting opportunities for economic, health or social transactions and activities. With an economy based largely on agriculture, tourism and manufacturing, the quality of Mississippi’s transportation system plays a vital role in the state’s economic growth and quality of life. In this report, TRIP looks at the top transportation numbers in Mississippi as the state addresses modernizing and maintaining its system of roads, highways, bridges and transit. An inadequate transportation system costs Mississippi motorists a total of $2.9 billion every year in the form of additional vehicle operating costs (VOC), congestion-related delays and traffic crashes. Driving on rough roads costs Mississippi motorists a total of $1.4 billion annually in extra vehicle operating costs. Costs include accelerated vehicle depreciation, additional repair costs, and increased fuel consumption and tire wear. Traffic crashes in which roadway design was likely a contributing factor cost Mississippi motorists a total of $1 billion each year in the form of lost household and workplace productivity, insurance and other financial costs. Traffic congestion costs Mississippi motorists a total of $530 million each year in the form of lost time and wasted fuel. Population and economic growth result in increased demands on major roads and highways, leading to increased wear and tear on the transportation system. Mississippi’s population reached approximately 3 million residents in 2016, a five percent increase since 2000. Mississippi had approximately 2 million licensed drivers in 2015. Vehicle miles traveled (VMT) in Mississippi increased by 19 percent from 2000 to 2016 –from 35.5 billion VMT in 2000 to 42.3 billion VMT in 2016. VMT in the state increased nine percent just in the last three years (2013-2016). From 2000 to 2015, Mississippi’s gross domestic product, a measure of the state’s economic output, increased by 14 percent, when adjusted for inflation. U.S. GDP increased 27 percent during this time. A lack of adequate state and local funding has resulted in nearly two of every three miles of major urban roads and highways in Mississippi having pavement surfaces in poor or mediocre condition, providing a rough ride and costing motorists in the form of additional vehicle operating costs. The pavement data in this report, which is for all arterial and collector roads and highways, is provided by the Federal Highway Administration (FHWA), based on data submitted annually by the Mississippi Department of Transportation (MDOT) on the condition of major state and locally maintained roads and highways. Overall, 28 percent of Mississippi’s major locally and state-maintained roads and highways have pavements in poor condition and 27 percent are in mediocre condition. Fifteen percent of the state’s major roads are rated in fair condition and the remaining 30 percent are rated in good condition. Forty-three percent of Mississippi’s major locally and state-maintained urban roads and highways have pavements in poor condition and 21 percent are rated in mediocre condition. Twelve percent of major urban roads are in fair condition and the remaining 24 percent are rated in good condition. Twenty-five percent of Mississippi’s major locally and state-maintained rural roads and highways have pavements in poor condition and 28 percent are rated in mediocre condition. Fifteen percent of major rural roads are in fair condition and the remaining 32 percent are rated in good condition. The chart below details the share of pavement in poor, mediocre, fair and good condition in the state’s largest urban areas. Roads rated in mediocre to poor condition may show signs of deterioration, including rutting, cracks and potholes. In some cases, these roads can be resurfaced, but often are too deteriorated and must be reconstructed. Long-term repair costs increase significantly when road and bridge maintenance is deferred, as road and bridge deterioration accelerates later in the service life of a transportation facility and requires more costly repairs. A report on maintaining pavements found that every $1 of deferred maintenance on roads and bridges costs an additional $4 to $5 in needed future repairs. Twelve percent of locally and state-maintained bridges in Mississippi show significant deterioration. This includes all bridges that are 20 feet or more in length. Twelve percent of Mississippi’s bridges (2,098 out of 17,068) are structurally deficient, the twelfth highest share in the nation. A bridge is structurally deficient if there is significant deterioration of the bridge deck, supports or other major components. Structurally deficient bridges are often posted for lower weight or closed to traffic, restricting or redirecting large vehicles, including commercial trucks and emergency services vehicles. The chart below details the share of structurally deficient bridges in the state’s largest urban areas. Improving safety features on Mississippi’s roads and highways would likely result in a decrease in the state’s traffic fatalities and serious crashes. It is estimated that roadway features are likely a contributing factor in approximately one-third of all fatal and serious traffic crashes. A total of 3,109 people were killed in Mississippi traffic crashes from 2011 to 2015, an average of 622 fatalities per year. Mississippi’s overall traffic fatality rate of 1.70 fatalities per 100 million vehicle miles of travel in 2015 was significantly higher than the national average of 1.13 and the third highest rate in the nation. The fatality rate on Mississippi’s non-interstate rural roads in 2015 was more than four times that on all other roads in the state (2.93 fatalities per 100 million vehicle miles of travel vs. 0.70). The chart below details the average number of people killed in traffic crashes from 2013 to 2015 in the state’s largest urban areas, as well as the cost per motorist of traffic crashes. Traffic crashes in Mississippi imposed a total of $3.1 billion in economic costs in 2015. TRIP estimates that traffic crashes in which roadway features were likely a contributing factor imposed $1 billion in economic costs in 2015. According to a 2015 National Highway Traffic Safety Administration (NHTSA) report, the economic costs of traffic crashes includes work and household productivity losses, property damage, medical costs, rehabilitation costs, legal and court costs, congestion costs and emergency services. Increasing levels of traffic congestion cause significant delays in Mississippi, particularly in its larger urban areas, choking commuting and commerce. 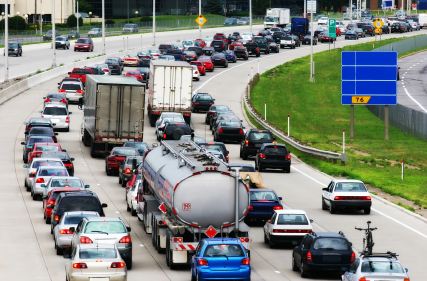 Traffic congestion robs commuters of time and money and imposes increased costs on businesses, shippers and manufacturers, which are often passed along to the consumer. Based on Texas Transportation Institute (TTI) estimates, the value of lost time and wasted fuel in Mississippi is approximately $530 million per year. The chart below details the number of hours lost to congestion by the average driver in the state’s largest urban areas, as well as the annual cost of traffic congestion per driver in the form of lost time and wasted fuel. Investment in Mississippi’s roads, highways and bridges is funded by local, state and federal governments. The current five-year federal surface transportation program includes modest funding increases and provides states with greater funding certainty, but falls far short of providing the level of funding needed to meet the nation’s highway and transit needs. The bill does not include a long-term and sustainable revenue source. According to the 2015 Status of the Nation’s Highways, Bridges and Transit: Conditions and Performance report submitted by the United States Department of Transportation (USDOT) to Congress, the nation faces an $836 billion backlog in needed repairs and improvements to the nation’s roads, highways and bridges. The USDOT report found that the nation’s current $105 billion investment in roads, highways and bridges by all levels of government should be increased by 35 percent to $142.5 billion annually to improve the conditions of roads, highways and bridges, relieve traffic congestion and improve traffic safety. The efficiency of Mississippi’s transportation system, particularly its highways, is critical to the health of the state’s economy. Businesses rely on an efficient and dependable transportation system to move products and services. A key component in business efficiency and success is the level and ease of access to customers, markets, materials and workers. Annually, $277 billion in goods are shipped to and from sites in Mississippi, mostly by truck. Seventy-seven percent of the goods shipped annually to and from sites in Mississippi are carried by trucks and another eight percent are carried by courier services or multiple mode deliveries, which include trucking. Sources of information for this report include the Federal Highway Administration (FHWA), the American Association of State Highway and Transportation Officials (AASHTO), the Bureau of Transportation Statistics (BTS), the U.S. Census Bureau, the Texas Transportation Institute (TTI) and the National Highway Traffic Safety Administration (NHTSA).